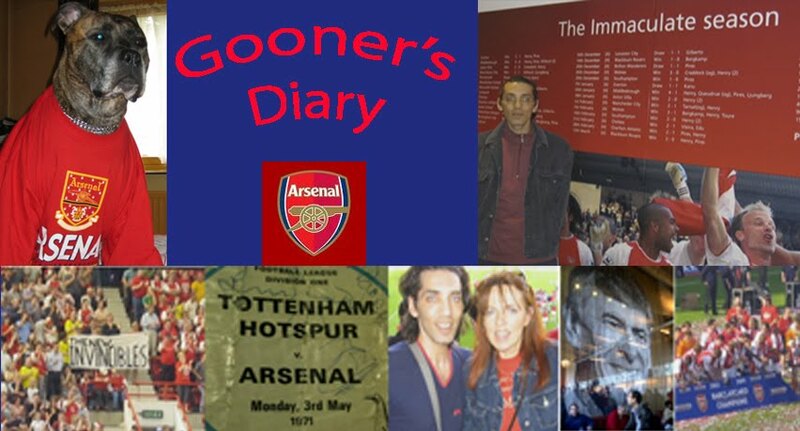 Gooner's Diary: No Arsenal, No Withdrawals....No Sh*t! No Arsenal, No Withdrawals....No Sh*t! In the past, an entire week watching other sides play without an Arsenal fixture was the equivalent of being condemned to doing time in purgatory. It’s perhaps indicative of our morose Gooner melancholia that this currently isn’t the case. For decades now I’ve been teasing my Spurs pals on St. Totteringham’s Day (the celebratory occasion when our league superiority is confirmed), with the traditional text message salute “Never mind mate, always next season!” Yet after the “death in the family” type agony that we endured at White Hart last week and (in the cyclical nature of things) the traumatic prospect that “next season” might have finally come around (first time since 1995, when George Graham was sacked! ), it felt as if the gods had smiled upon us, saving us from more Arsenal angst by giving us the week off. Then again, the fates can be so cruel that this could just be the calm before the storm set-up, for a humiliating ‘end of season’ finale at the Allianz Arena in Munich on Weds? It was difficult not to wallow in our Derby defeat but instead, I put my feet up on the sofa and savoured the Schadenfreude of Fergie’s apoplexy at Nani’s ejection (s’funny Ol’ Red Nose’s sense of injustice wasn’t the least bit piqued when Manny Eboue received a red card for a similar assault on Evra at Old Trafford), or of Everton getting stuffed at Goodison by Wigan. Mind you, it was the Toffees FA Cup swansong that caused the match at our place to be postponed and I would’ve quite fancied encountering the shamefully unfocused Everton side that Moyes sent out on Saturday. I recall first being impressed with Moyes back in 1999, listening to him taking questions at a press conference after the Gunners came back from 2-0 down to beat Preston North End 2-4 in the FA Cup 3rd round. For some reason this took place outside and with his inquisitors sat above him on the steeply elevated seats at Deepdale, it felt as if we were being lectured to, by a manager who was destined for greater things. Nowadays the stern Scot seems to be in the frame for every potential vacancy at any of the ‘big’ clubs, despite the fact that his Everton teams have consistently failed to deliver. Yet even the authority of managerial titans like Fergie, seems to be waning, in inverse proportion to the astronomic earnings of their star turns, once they step out onto the turf nowadays. The St Vitus Dance touchline antics of dinosaurs, such as those of Ians Warnock and Holloway, have largely given way to the ‘laissez-faire’ attitude of all those who sit back in their Recaro style car seats, in the certain knowledge that they’ve no further part to play (until a bad decision pushes their ejector button) and that the only thing they’re likely to encourage by getting hot under the collar, is a premature heart attack. Does the fact that Marouane Fellaini was booed off by the Blues’ fans reflect on Moyes motivational skills, or the big Belgian fella’s lack of commitment to the cause? I’d definitely like to see a player with his intimidating presence playing in red & white. But it was another Belgian who impressed me in midweek, as Dembele had something of the Vieira about him, as he dominated the middle of the park against Inter on Thurs night. Keep it under your hat, but I tried out my Europa Cup training wheels, after being invited to go and watch Spurs barely break sweat, in swatting the Italian’s surprisingly feeble challenge. It wasn’t easy sitting there like a cuckold, listening to the Cockerels crow (although I was tempted to join in with the chorus of “Are you Arsenal in disguise?”). But I came home praying that the 3-0 drubbing was more down to a disappointing display from a decrepit, disinterested Inter side, as the thought of Spurs surfing through the remainder of the season, on the surge of confidence brought about by shaking off the shackles of North London inferiority, really doesn’t bear thinking about. I only wish we were travelling to Germany on Weds, still clinging to the hope that would be engendered by having a world class goalscorer, capable of turning this tie on it’s head. Ho hum, guess I’ll have to settle for the comforting prospect of coming home with a carrier bag full of cheap Camel ciggies? Great to have you back Bernard. Keep posting and we will keep reading.